There is a small public lot and ample parking across the street - no charge. Please inquire with our reservations team for details or visit http://www.thomaskeller.com/yountville-california/bouchon-bistro/private-dining-events-general-information. Highly acclaimed chef Thomas Keller (of The French Laundry) is behind this beautiful Yountville restaurant. 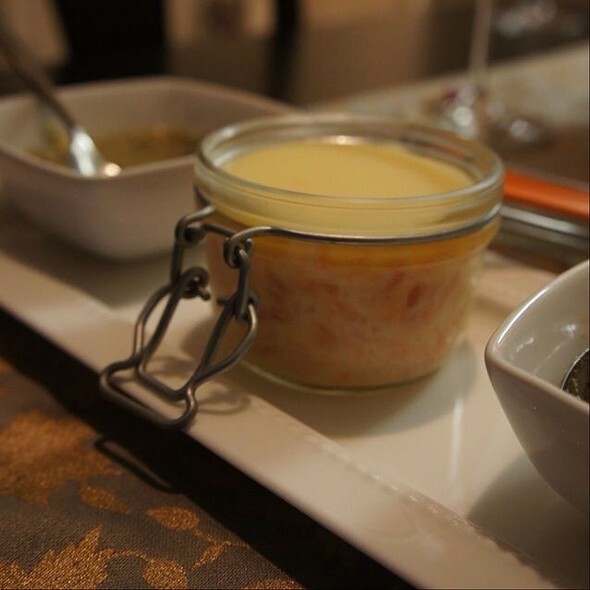 Enjoy excellent French bistro cuisine in a dining room offering wonderful Parisian ambiance. 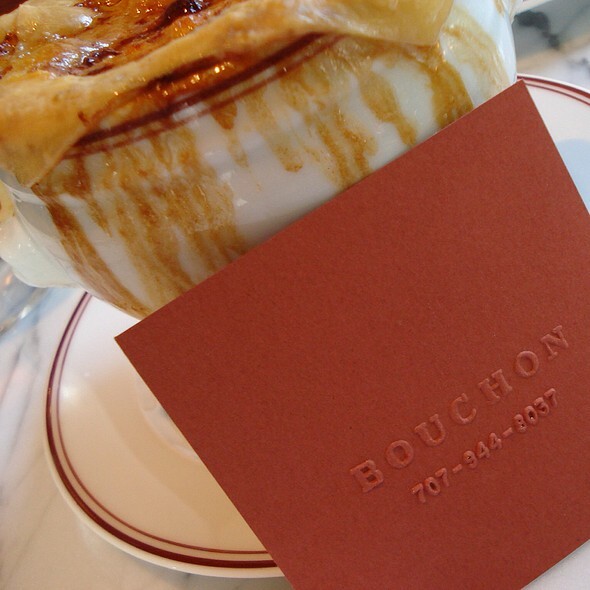 We invite you to visit Bouchon Bakery, an authentic, country-style boulangerie located next door Bouchon Bistro. The Bakery serves traditional French breads and pastries and is open from 7am - 7pm daily. Food quality terrible, attention to details doesn’t exist!! Can’t see how they have a Michlin star! Michelin Guide OUGHT TO revise it!!! It was a deception in all requirements!! Just a scosche slow. But probably our fault as we collectively agreed we could have stayed another hour. Excellent food and service, ambiance is a little chaotic. Restaurant is very noisy and seating is basic. I was seated next to the server supply station and had servers kneeling inches beside me for my entire meal ( I reserved a table a month in advance). Great place for a casual meal with amazing food and service, not really good for special occasions. My mistake was coming here to celebrate my gf's 40th birthday. outstanding service and excellent food in such a perfect setting. Noise level high, yet we could still converse easily. Trout was superb. Noise level was out of control! We all had major headaches when we left. We paid 10 dollars extra for truffle to be added to fries but there was little if not any added. The corkage fee for wine was 35 which is pricey. A fun and wonderful experience. Everything from drinks to food was spectacular. Recommend 100%. Wonderful menu. Enjoyed every bite. Service Was supurb. Amazing lunch! Salmon was cooked perfectly! My friends loved it too! 10/10! Ina our server was kind and welcoming.. we felt totally cared for by her!!! 1 meal came to the table cold, by the time my wife received her food, the rest of us had eaten our meals. No apologies or "comping" her meal. We were very disappointed. I was disappointed, perhaps because of my very high expectations. Given the restaurant's reputation and prices, my experience was sadly just average. Excellent restaurant, and the food was wonderful. I had the halibut which was perfectly prepared. This restaurant is open late , a unique advantage in Yountville. I plan to return. We arrived early and were able to be seated right away. Our waiter, Brendan was full of hospitality. He gave us room to make our decisions without being pushy. Our food was amazing. My daughter went traditional French with trout almondine. I had the gnocchi with spring vegetables. We shared dessert. Crepe cake. The whole experience was worth every penny. It was a beautiful way to end our time in Napa Valley. 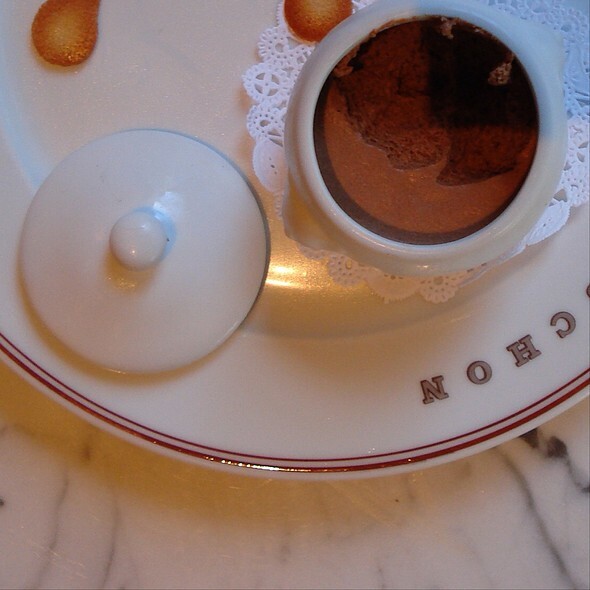 I have had 4 amazing meals in a row at Bouchon. Their trout is always terrific. Their smoked salmon is cured to perfection. their special pastas are mind blowing. Fantastic brunch experience! Everything was delicious! The menu was great - there were the perfect number of options, and each of them sounded delicious. Not overwhelming in number of options; just enough to satisfy what you might be after - a chx option, 2 steak options, and 3 seafood options for the entree. We sat on the patio under a heater, and it was much much quieter than being inside. Very lively inside. We enjoyed the small private patio. 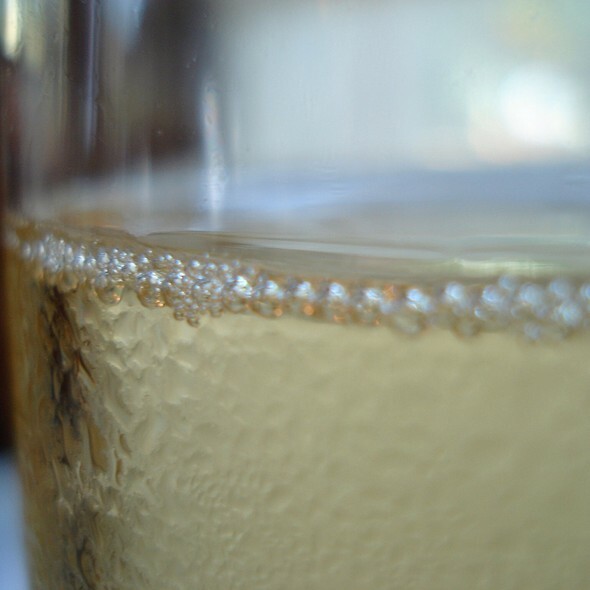 The sommelier was very kind and deferential, and pored over the list with one member of our party. We were all getting different meats, and we wanted one bottle for the party, so the choice was difficult. One of the 4 of us ordered the steak frites and was not satisfied with the temp of his steak. Not only did they comp the steak, but they brought us complimentary wine pairings for our entrees and comped dessert as well. We will be going back next time we're in Yountville. 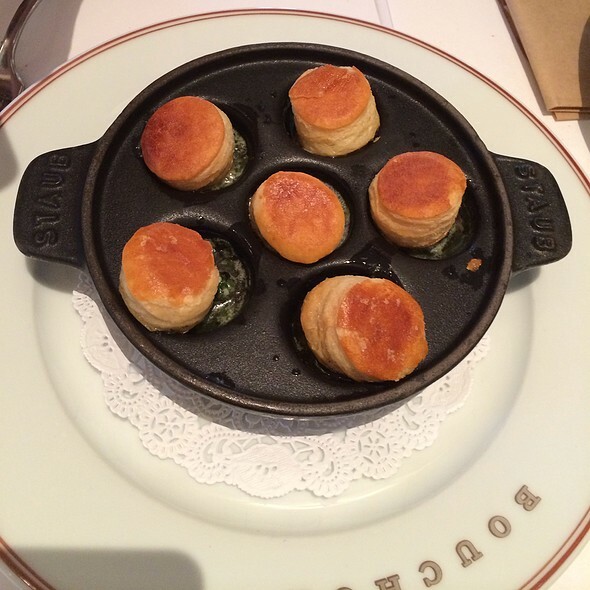 Bouchon is consistently a memorable meal and experience. We are so happy to live in the valley and enjoy this, our special occasion restaurant. Delicious food, great service and the ambience is amazing. 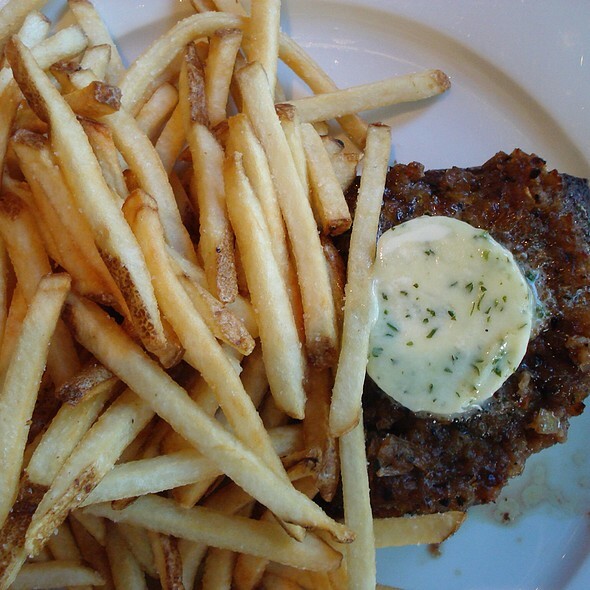 Best truffle fries in the whole world, Bouchon is always a blast to be at! Had a birthday celebration last night; party of four. Really a perfect night. The service was attentive and the team was very knowledgeable. Food was outstanding from the apps, mains, cheese, and dessert. These guys are real pros. One tip- don’t fill up on the bread. Will definitely be back. I had the veal which was recommended by our waiter. The cream sauce overwhelmed the rest of the flavors. I didn’t enjoy it as much as I thought I would. My partner had the salmon entree and it was moist and flavorful. She enjoyed it very much. The noise level was too much. We were in a corner table for two flanked by two long tables filled with people. Our corner caught all of the sounds in the room. Also our table being in the corner didn’t have room for both our legs. I would not recommend using this location for a table setting. If we come back I would insist on another table. The service was excellent! The charcuterie and the duck confit were excellent. Unfortunately the other food we ordered missed the mark. The mussels lacked flavor, the onion soup did not have a savory balance (onions were very sweet) and the crouton was completely soaked and dissipated in the soup, and the gnocchi didn’t have much seasoning. The noise level prevented any conversation in this very crowded seating area. We probably won’t give it a second chance unless something changes. We were celebrating 14 years of merrige. Everything was great! The service and food are wonderful as expected. The spring salad was one of the best I had ever tasted. The noise level on a Sunday night was a bit loud, and some of our party had trouble hearing. For casual fine dining, this place doesn't disappoint with the food. It was way too busy for our waiter to get to us and to give us any sort of real attention during our visit though he tried. What we ordered was mediocre at best and then they forgot to acknowledge a birthday in our party. In all honesty we had just been to the French Laundry which set our expectations for Bouchon by the same chief rather high and it barely reached mid level. Felt rushed. Was not pleasant. Crammed as many tables against wall as possible. Should remove one. Couple next tonme couldn’t get out because tables so close together. Almost spilled our drinks because tables too close. Excellent everyday French cooking in a great setting. Pricey, but definitely worth it in Yountville. I was disappointed with our lunch. While the baby clams we had as an appetizer were small, tender and sweet, the croque madam entrée was a dull, uninspired dish, and over-priced for what it was. We had a better experience on an earlier visit two or three years ago. Despite this, I will admit I would recommend to others, and will go again. This place was great. Had reservations and they seated us about 30 minutes early which was great. Our waitress was awesome wish I could remember her name. The food was the best. Would definitely recommend. We came for Sunday brunch. The pastries are a must. It was an excellent experience. If you’re in. Napa, don’t miss Bouchon. 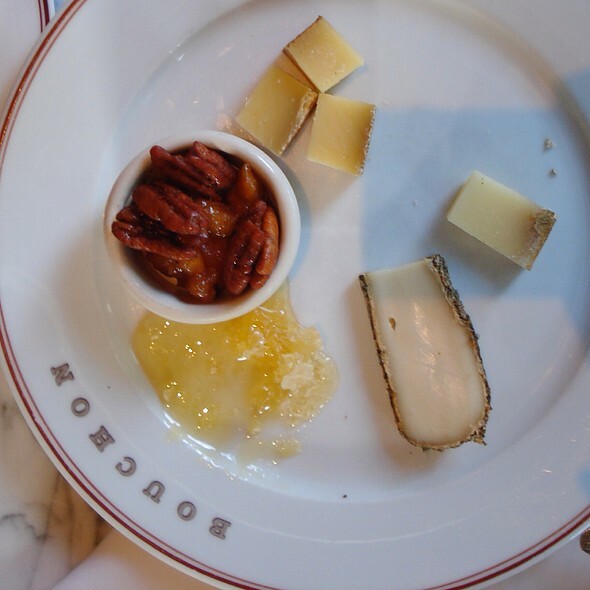 Bouchon was the spot I picked for my birthday dinner. I was looking forward to a great French comfort dish. The menu was very disappointing, portions were small and food preparation was awful. My husband had the salmon which cane with a delicious sauce.. the problem was, the sauce was on the bottom, then a layer of chunky veggies then the salmon. You could not get to the sauce without deconstructing the entire plate. The waiter suggested the sausage for my meal. Although it was good, it was not outstanding nor was it anything I would consider ordering again. The presentation was not good. 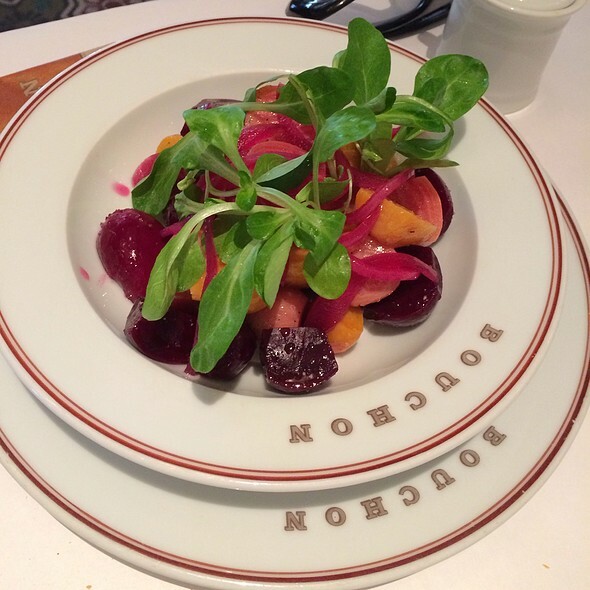 Out of the 6 “ top name” restaurants we dined while in Yountville, Bouchon came in at the very bottom of our list. 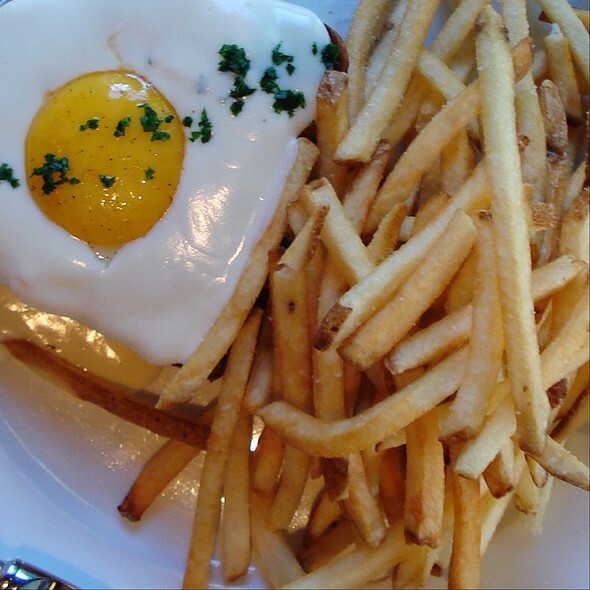 Croque Madame - ok but after the caviar with the same bread, it was a bit overwhelming. Also large truffle fries.